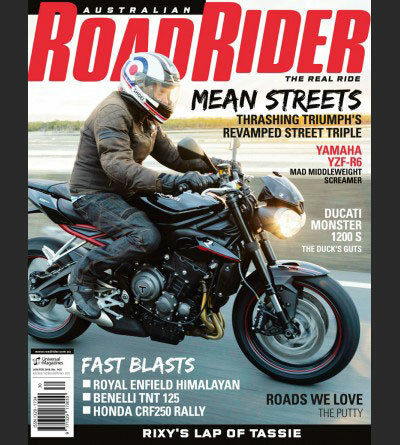 Some time ago, I was involved in writing a guide to group riding for the Snowy Region Motorcycle Safety Group. The project was initiated by the Motorcycle Council of NSW and financed by the Motor Accidents Authority. You can thank them for the guide below, which may just save another few lives. Suggestions for and contributions to this guide came from far too many people for me to be able to thank them all individually, but you know who you are and you know how much you helped.Thank you. The guide began with the statement that “motorcycle riding is potentially dangerous and you could be killed or severely injured.” That sounds a bit heavy, but when you see how some people behave on group rides you realise that they have to be shocked into considering just what it is they’re doing. Most participants, just like most motorcyclists anywhere, are sensible. This is an attempt to help everyone to be sensible. Let’s start with some suggestions for organisers. Careful planning will make your ride safer and more enjoyable. Following these suggestions is not, however, a guarantee of a fun and safe ride. When you do your planning, create a plan B in case of problems. Distribute a mud map to riders showing the route, stops and anything else important on the ride. Include mobile phone contact numbers for organisers. Consider putting together a checklist of things to bring and give each rider one of those well before the ride. Find a rest area map or a local tourist information map of the route to use for your planning. Consider giving a copy to each rider with or instead of the mud map. It’s easy to highlight the route with a coloured pen. Plan frequent stops and make them multi-purpose (fuel, food, toilet, drinks etc). To avoid fatigue, riders should keep hydrated ideally by drinking lots of water. Suggest they avoid too many coffees or sweet soft drinks and stay away from alcohol whatever you do. You might also suggest they have a good breakfast and snack during the day. A light and non-fatty lunch is a good idea. Choose stops that have enough room for the whole group to pull off the road safely. Appoint a responsible group leader who knows the route and get her or him to ride at a speed suitable for the least experienced rider. Appoint a responsible tail rider and consider equipping him or her with a first aid kit, a basic tool kit and a tyre repair outfit. Be aware of afternoon fatigue. Try to plan for rides to be over by 3pm and remember to suggest a light and non-fatty lunch. Extra daylight in summer doesn’t mean extra alertness, so don’t let rides drag into the evening. Find out who has first aid training and/or is carrying a first aid kit. Identify these people to the other participants. Try to make sure you have at least one such person on the ride. Distribute your map and explain it. If you don’t have a map, describe the stops verbally. Brief riders carefully about the behaviour you expect on the ride (see ’Conduct’). Agree on a set of hand signals (see below). Explain the corner marking system (see below) and brief everyone on the signals to expect. Remind everyone that their fuel tanks should be full and that they should refuel when everyone else does even if they still have plenty of petrol. If your group is large, split it into subgroups. These may be organised by skill level, local knowledge, friendship etc. Small groups are more manageable and safer; the dangers of group riding increase steeply with group size. Appoint someone to keep an eye on inexperienced riders. No rider should pass the group leader. At each stop, announce and, if necessary, explain the next one. Anyone experiencing a problem should pull over and await the arrival of the tail rider, whose job it is to help. Stop: Left hand held up, forearm vertical. Slow down: Left arm extended straight out, palm down. Hazard: On left side of bike, point and continue pointing at hazard with left hand. On the right side, point and continue pointing with right leg. Mark this corner: Pat top of helmet with open hand. Your blinker is on: Extend left arm and open and close fingers. Group leader and tail rider stay in position during the ride. Others take turns marking. At an intersection where the ride turns, the leader signals for the rider immediately behind her or him to mark the corner. That rider stays on the corner, in a clearly visible and safe position, and points out the turn to following riders. When the tail rider arrives, he or she signals the corner marker either by sounding the horn or an agreed hand signal. The marker then pulls in front of the tail rider and continues. It is vital that markers not try to work their way up through the group to get to the front again. This is how many accidents happen. 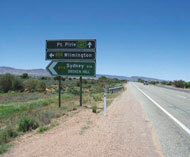 There are many rest areas along Australian roads. These are signposted and make excellent places to stop and regroup or refresh yourself. During holiday times and on long weekends, Driver Reviver stops may offer a great opportunity to stop safely and have a free snack and drink. Keep the first aid suggestions printed with this article handy. Mobile phone coverage in the country may be limited, but always try dialing 000 even if there seems to be no signal. If you still have no luck, try moving to another location where the signal could be better. Ensure the tail rider at least is carrying a first aid kit. Any rider who comes upon an accident should position his or her bike in an easily visible position on the road and switch emergency blinkers on, if fitted. Otherwise left-hand blinkers will do. They should make the accident scene safe . i.e. put out any fire, turn off the engine, fuel etc. Then she or he should administer first aid or, if not sure what to do, wait until the arrival of someone who is trained. The rider should call for help by mobile. If there is no coverage, a rider should be dispatched to get help. It may be best to send one in each direction. The rider should also send others to the nearest corners to warn oncoming and following traffic to slow down. All excess riders and bikes (those not required at the scene) should leave and congregate somewhere safe, well away from the scene. What about you, the riders? Are you a group rider? Chances are that you are, at least occasionally. Most of these pointers refer to organised rides, but you don’t need to be on an organised ride to be part of a group. Just travelling with bikes you encounter on the road makes it a group ride and creates some dangers. Here’ s how to avoid some of them. Make sure your motorcycle is in good condition. It is both unsafe and inconsiderate to show up for a ride on a dud bike. Pack your tool kit and a tyre repair outfit and make sure you know how to use them. It’s unfair to rely on others to keep you going. Check your tyres; they wear faster at the end of their lives and they are more likely to be punctured then, as well. Fill your fuel tank and attend to calls of nature. Eat small amounts of simple foods before and during rides; avoid large and fatty meals to stay as alert as possible. To avoid fatigue, you also need to stay hydrated. Drink lots of water; stay away from coffee and sweet soft drinks, and avoid alcohol at all costs. Have a good breakfast and snack during the day. Otherwise eat light and non-fatty meals before riding. Pack a mobile telephone and a map but remember that phone coverage may be patchy, and consider carrying a first aid kit. Check that you and your pillion, if you have one, are dressed for the conditions. Make yourself aware of local conditions and remember the weather can change very quickly. Make sure you understand what is expected of you on the ride; learn the hand signals and the corner marking system and see that you can identify the lead and tail riders. Be aware that even in a group you are responsible for your own safety and that of the group. Keep an eye out for hazards and stay on your side of the centre line. Ride with others who have a similar level of skill. Ride within your own limitations, including comfort and concentration levels. 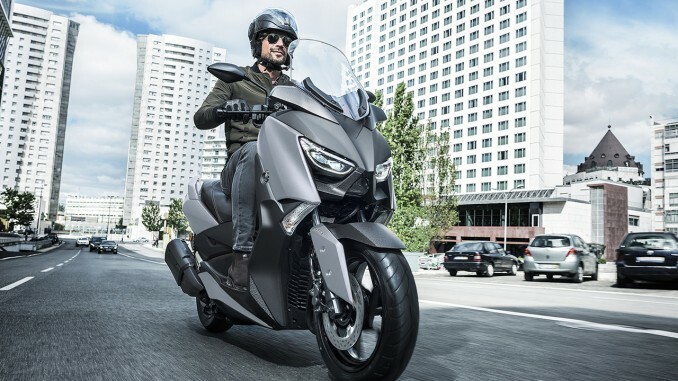 If you begin to feel uncomfortable, start running wide on corners or find that your bike doesn’t seem to be coping, slow down and drop back if necessary. If you’re struggling, stop! 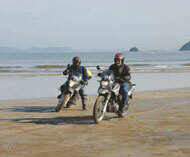 Keep an eye on the rider in front of you, but don’t become mesmerised by him or her. Ride in single file, not in staggered formation, and allow at least three seconds between you and the bike in front of you. Stay where you are in the group once it is moving. Overtaking is one of the prime causes of accidents. Overtake only if you see that the rider in front of you is pulling off the road. In that case, the tail rider will take care of any problems. If you overtake another vehicle or change lanes for any other reason, remember the rest of the group will need to do so as well, and do it safely. Be considerate of others, both in your group and on the road generally. It’s both polite and safe. If the group’s speed is faster than you are comfortable with, drop out and ride on your own. On an organised ride, advise the tailrider. If you fall behind, don’t try to catch up; many accidents happen that way. A group ride is not a race. Meet the others at the next stop. Here are a few country hazards that can pose a real danger to motorcyclists. Wildlife can be a problem on country roads, especially early and late in the day — but not only then! You do not want to hit an animal. In scenic areas, keep an eye out for slow (or even stopped) cars filled with tourists enjoying the scenery. In the mountains and inland, snow and ice (especially the almost invisible black ice) are hazards in winter and potentially at any time — especially in the shade. The weather can change quickly. Once it gets cold, wind and the wind chill factor can be deadly. If you get too cold, you don’t function properly; getting too hot can increase fatigue. You may need to share narrow roads with oncoming traffic; never allow your head to stray into the path of an oncoming vehicle. Never travel so fast you can’t stop in the distance you can see. Other hazards may include blind and off-camber corners, compound corners in rugged terrain, fires, mud and rock slides, and road surfaces damaged by the extremes of the climate. The most important thing to remember is that what you can’t see will almost certainly hurt you. Slow down so you can cope with unexpected corners, get out of the way of oncoming traffic and deal with other hazards. This guide is not advice. It is just something for you to think about when planning or taking part in group rides. Nobody can provide any guarantees about the accuracy, reliability, completeness or timeliness of this guide. It is not comprehensive and it may be out of date or not current. This guide is general and may not include information covering particular subjects or issues relevant to you or to your particular circumstances. You must satisfy yourself about the extent to which you follow this guide and whether you inform yourself in more detail. You should carefully consider whether this guide is appropriate for yourself and your particular circumstances at the time. Much of what is good and useful in this guide has been contributed by others; errors and omissions are almost certainly mine. On the way across the Horrocks, the Horrocks!